Marie Collard is the lead author of a new publication on the resilience of Sea Urchins to near-future ocean acidification, which was just issued by Global Change Biology. The paper is a contribution to the vERSO project, which the Marine Biology Lab is coordinating. Find out more one the paper here. Abstract: Increasing atmospheric carbon dioxide concentration alters the chemistry of the oceans towards more acidic conditions. Polar oceans are particularly affected due to their low temperature, low carbonate content and mixing patterns, for instance upwellings. Calcifying organisms are expected to be highly impacted by the decrease in the oceans’ pH and carbonate ions concentration. In particular, sea urchins, members of the phylum Echinodermata, are hypothesized to be at risk due to their high-magnesium calcite skeleton. However, tolerance to ocean acidification in metazoans is first linked to acid–base regulation capacities of the extracellular fluids. No information on this is available to date for Antarctic echinoderms and inference from temperate and tropical studies needs support. 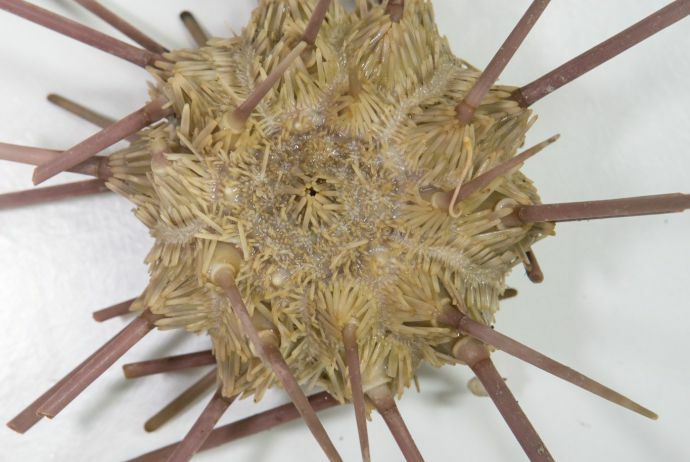 In this study, we investigated the acid–base status of 9 species of sea urchins (3 cidaroids, 2 regular euechinoids and 4 irregular echinoids). It appears that Antarctic regular euechinoids seem equipped with similar acid–base regulation systems as tropical and temperate regular euechinoids but could rely on more passive ion transfer systems, minimizing energy requirements. Cidaroids have an acid–base status similar to that of tropical cidaroids. Therefore Antarctic cidaroids will most probably not be affected by decreasing seawater pH, the pH drop linked to ocean acidification being negligible in comparison of the naturally low pH of the coelomic fluid. Irregular echinoids might not suffer from reduced seawater pH if acidosis of the coelomic fluid pH does not occur but more data on their acid–base regulation are needed. Combining these results with the resilience of Antarctic sea urchin larvae strongly suggests that these organisms might not be the expected victims of ocean acidification. However, data on the impact of other global stressors such as temperature and of the combination of the different stressors needs to be acquired to assess the sensitivity of these organisms to global change.